The striped skunk is an interesting component of New York’s wildlife assortment. It is about the size of a house cat and has a potent musk that often overshadows the beauty of its glossy and durable fur. Formerly a member of the weasel family (with mink, otter, fisher, marten), skunks have now been classified into their own family, “Mephitidae”. Like the more glamorous members of the weasel family, the skunk also has glossy and durable fur that can be dyed uniformly black for exquisite garment trimming. The striped skunk can be a difficult neighbor because of its fearlessness and effective weaponry. 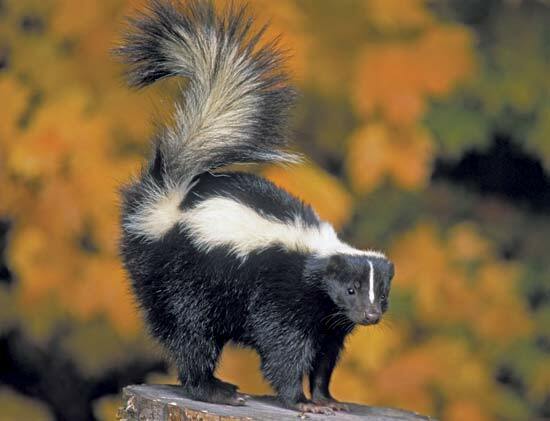 One of the most common skunk complaints, a strong odor of skunk essence during the nights of early fall, often is the result of inadequate home maintenance and of allowing dogs to roam free at night. This happens in early fall because skunks search for cubby holes to spend the winter. Damaged building foundations and spaces underneath porches serve this purpose well. A free roaming dog often aggravates the situation by chasing the prowling skunk. The resultant “dog training lesson” can offend a whole neighborhood. The remedy is to close or screen all holes and crawl spaces, and to keep dogs confined. An interesting side note is that house cats tolerate the presence of skunks. In the days of small dairy farms, several dozen barn cats often ate from the same pan of milk after each milking. Many a farmer arrived to pour the dregs of the milk strainer into the cat dish and found that one of the cats had a broad tail and a characteristic white “V” across its back. For this reason, it is not wise to feed a house cat outside your home after dark.